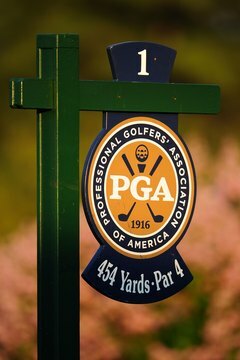 PGA stands for "Professional Golfers' Association of America." As with any large undertaking, the golfing world has developed its own language, including a variety of abbreviations and shorthand terms. Some are used for convenience in conversation, while others are mainly employed in print. Understanding these abbreviations can help newcomers speak and read the language of golf. Numerous golfing entities are known by their initials. Most notable in the United States is the USGA, which stands for United States Golf Association. The USGA generally regulates golf in the United States and Mexico, publishes the standard Rules of Golf, and runs the U.S. Open and a few other tournaments. Members of the PGA -- the Professional Golfers’ Association of America -- teach golf at courses and other facilities across the United States. It should not be confused with the PGA Tour, a separate organization originally organized by the PGA that oversees most of the top men’s pro golf events in the United States. The Ladies Professional Golf Association is an organization made up of the LPGA Tour and club professionals. Another worldwide organizational abbreviation of note include the R&A (Royal and Ancient Golf Club, based in Scotland), the governing body of golf worldwide, except in the United States and Mexico. If you see the letter “a” before a player’s name in a golf tournament summary -- also known as a box score -- it means the player is an amateur. Amateurs occasionally play in professional tournaments, but they do not receive prize money. In a match play summary, a line may read “Player A def. Player B, 3 and 2.” The “def.” stands for “defeated.” The numbers indicate that Player A led by three holes with just two remaining, therefore mathematically eliminating Player B from the match. In this example, therefore, Player A has won the match by taking a three-hole lead after 16 holes of play. If you walk into a golf course’s clubhouse you’re likely to hear the terms “in” and “out” used to describe someone’s 18-hole round. A golfer might say, for example, “he went out in 47 but came in at 39.” The word “out” refers to the front nine holes while “in” refers to the back nine. In this example, therefore, the player shot 47 for the first nine holes but improved to 39 for holes 10 through 18.